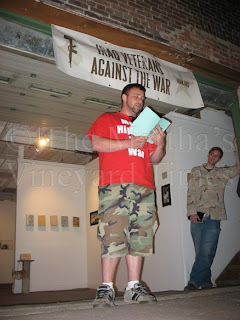 The Martha's Vineyard, Mass., Times reports that two dozen Iraq War veterans will arrive on July 21, for the Combat Papers Project, where they will learn papermaking and be involved in writing workshops. "The veterans will bring their uniforms with them, which, after being torn or cut up, will be transformed into paper to be used to record some of their experiences, in art and/or words," The Times reports. The project is a kind of "a healing ritual, a way to help put demons to rest. It has also become a movement spreading around the country, and next week it comes to the Vineyard," according to The Times. A documentary is underway about the Combat Papers Project called "Iraq Paper Scissors." It is by documentary filmmaker Sara Nesson who says her father, Bob Nesson, a Boston-area documentarian who has been working on a project on Post-Traumatic Stress Disorder in Iraq vets, gave her direction her documentary. "All of this -- cutting up uniforms, making paper, writing -- was healing. I saw transformation right before my eyes," she says. She plans to continue to film the veterans in New York state and northern California this fall, as they teach papermaking to disabled veterans and other vet groups.